Comtech EF Data and our subsidiary, Memotec, are recognized leaders in providing products to enable cellular backhaul over satellite. Memotec is the market leader in RAN, Voice and Data optimization over satellite networks. Globally acknowledged as the leader in satellite bandwidth efficiency and link optimization. Comtech EF Data has a history of providing advanced solutions enabling users to reduce OPEX/CAPEX and increase throughput for satellite-based applications. To achieve this, Comtech has invested in technology to build value – one layer at a time. Memotec’s patented RAN Optimization is the most recent value added capability introduced into the Comtech EF Data product family. By optimizing the RAN traffic itself, the RAN optimization products can reduce the bandwidth necessary to support a deployed capacity by up to 50%. Less bandwidth = less bits = less satellite transponder capacity and OPEX. Memotec’s RAN Optimization products, built on top of Comtech EF Data’s other core technologies of VersaFEC® and DoubleTalk® Carrier-in-Carrier®, are now an integral part of Comtech EF Data’s comprehensive cellular backhaul product suite. RAN Optimization is available as the traditional stand-alone Memotec products or integrated into the modems themselves. 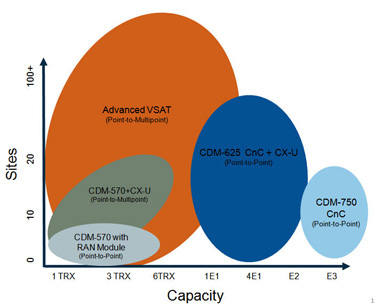 As a result, Comtech EF Data is the only company which provides a full product suite capable of satisfying backhaul requirements ranging from a few TRXs, to E1s, to E3s and/or IP. With guaranteed interoperability of modems, RF and RAN Optimization – all rolled up under a single network management – Comtech EF Data presents a truly unique product positioning in the market. The CX-U Series brings together a flexible access device and cellular backhaul traffic optimization, offering a variety of backhaul interfaces and transmission options. The CX-U offers Abis/Ater optimization, 2G/3G aggregation, DCME voice trunking optimization, TDM Pseudowire, all over IP, Frame Relay or MLPPP protocol support. Memotec’s NetPerformer Satellite Routers combine the functionality of a data router, a multiplexer and a voice gateway in a single device, enabling customers to create converged networks and transport any type of traffic over any type of satellite or terrestrial links.